Posted by chalutzproductions on February 5, 2013 in Dairy, Recipe, Video and tagged bubb, bubbe, fish, food, tuna. HOW ONE JEWISH GRANDMOTHER IS USING THE INTERNET TO GET AUDIENCES JAZZED ABOUT BLINTZES AND BORSCHT. For those who missed out on having a Jewish bubbe to teach you to bake strudel and cook chopped liver from scratch, good news—now you can have one. “Bubbe” is the host of the online kosher cooking show, Feed Me Bubbe. The idea for the show sprang from her grandson Avrom, who was looking for film experience after graduating from college. He began videotaping his grandma cooking and then posting episodes online. The show took off and has been featured on Frontline and ABC World News, as well as in the Wall Street Journal and the Boston Globe. This led Bubbe and Avrom to co-author Feed Me Bubbe: Recipes and Wisdom from America’s Favorite Online Grandmother (Running Press, 2011), which includes wisdom and 100 favorite recipes from the show. We couldn’t wait to interview this media darling along with her entrepreneurial grandson. Feed Me Bubbe was a video show before it was a book? Where did the idea come from and how did it evolve? Bubbe: … and I thought I was going to be retired, but you do what you can to help your grandchildren. Bubbe, I read that you worked as a full-time teller in a local bank until age 73. What inspired the career shift and how has it changed you? I worked at the operation center of the bank. I retired at 73. Feed Me Bubbe was not a career change. Avrom needed to get a job and needed a demo reel. I wanted to help my grandson Avrom get a job. It was not supposed to be a career change, just a way to help out my grandson. It turned into more than I could have ever imagined. Avrom, what is it like to work with your grandmother? What is your favorite recipe that she makes? Avrom: It is a dream come true. Could I ever believe that I would get to be able to have a career in the industry that I love while sharing time with my grandmother? I mean, seriously, who saw this happening? I would never have seen this coming, and yet, it has been an amazing experience—one that I constantly look forward to. As far as food, I never find that question fair since I always enjoy Bubbe’s food. But, if I had to choose, the first one that just came to mind is Bubbe’s Sweet and Sour Meatballs. It’s the perfect way to start a meal, as an appetizer; or, if you are hungry, you can turn it into a sub sandwich or even serve it over a plate of rice. The best part is it’s a lot of fun to make the small meatballs and get them ready to put into the sauce. Your book has a Yiddish word of the day. Why did you decide to include this? Do you worry about this language dying out? Bubbe: We wanted to have a book that would not only have recipes, but also encompass our video show, which is known and loved all over the world. In the video show, we have a Yiddish Word of the Day to provide a little bit more than just how to cook. This happens to be quite a favorite of our audience, and we couldn’t help but include it. There are so many Yiddish words that are used in our everyday language today. I don’t worry about Yiddish dying out today. It is less used, but there are still classes taking place. You may be familiar that there is even the Yiddish Book Center in Amherst, Massachusetts. I feel that it is important we keep Yiddish alive and not forget it completely. Why is it important to keep traditional Jewish recipes alive in our culture? Bubbe: I feel that it is necessary to keep our heritage and Jewish roots alive. One way is to provide traditional Jewish recipes. Jewish people live all over the world and use the food ingredients available in those areas. However, many of the basic traditional recipes can be adjusted today to be healthy and nutritional according to today’s lifestyle using the basics. This will give us traditional and family recipes as well as memories for generations to come, especially for Jewish holidays. Bubbe, can you share with us one of your favorite recipes and the memories that it has for you? Is flavor as important to you as memory association? Bubbe: One great recipe my mother made was strudel. We all loved it, and my mother even taught our non-Jewish neighbors how to make it for their holidays. I can picture her in my memory even today—how she made the dough into a large round circle that covered our whole kitchen table and then prepared the filling. However, like everything else it was a different time and a different era. Raising a family and working did not give me the time to duplicate my mother’s recipe. I had to find a way of making my own pastry that would take very little time and use my mother’s recipe for the filling. My children were young and liked to watch and help. They gave the recipe the name Jelly Jammies. Taste as well as memory is very important. It is something we don’t forget. Flavor is also very important, because without good flavor you don’t have a positive memory and experience, and the positive experience is what creates a memory association. What do you say to critics who complain that Jewish holiday dishes may be delicious, but are often too unhealthy? Bubbe: Yes, in the past, many of the ethnic recipes around the world were unhealthy, including Jewish holiday dishes. However, with the knowledge we have today of health and nutrition, I find that this statement is false. Every recipe through the generations has always been changed a little, but the basics were always there. It needs a little thinking and effort as well as knowledge to bring a recipe up to today’s health and nutritional standards. With the availability of so many healthy substitutes in food, this can easily be accomplished while still keeping the taste and the flavors for tradition, and memories for generations to come. Michelle Cove is the editor of 614 and the director of the feature-length documentarySeeking Happily Ever After: One generation’s struggle to redefine the fairytale(www.seekinghappilyeverafter.com). She is also the author of the book Seeking Happily Ever After: How to navigate the ups and downs of being single without losing your mind (and finding lasting love along the way) (Tarcher/Penguin, 2010). Posted by chalutzproductions on January 30, 2013 in Newspapers / Magazines, Press. We all need food and we eat it everyday. There’s no shortage of the number of cooking web shows, recipes, and cookbooks available on the Internet and in stores. We hear celebrities talk about new diets and we look forward to the traditional pumpkin pie at Thanksgiving. It’s a part of our lives and our heritage in many ways. A new web show is cashing in on this idea with the always wonderful, Bubbe. Bubbe is a Jewish grandmother (the grandmother of the producer actually) who decided to create a web show where she shares her traditional Jewish snacks and meals with the rest of the world. In one episode she introduces viewers to her vegetarian stew. In another it’s a delicious brisket. Either way, you can’t lose with Bubbe. A personal favorite of mine would be the three episodes devoted to chicken soup (delicious!). If you’re looking to find food that tastes good and is reminicist of a culture of people then don’t look anywhere else. Bubbe has it all ready for you. Bubbe signing her book for one of her fans. What is most fascinating about this web show is the topic. Most cooking shows focus on more specific countries rather than a group of people. This makes for a unique show. However, the most unique aspect of the show is its realism. Bubbe is not only a very real person, but she is everything that she represents. She isn’t pretending to be Jewish or a grandmother. She isn’t pretending to be a high-end chef, but rather a Jewish grandmother who is opening her kitchen and her homemade recipes to the world. It’s enticing and it separates Feed Me Bubbe from all of the other cooking web shows. Watching Bubbe make her signature dishes is like watching your own grandmother make hers. If you can’t get enough of the web show, Bubbe has even created her own book filled with the best recipes so you can make Jewish dishes any time you like. For some, the show may be too slow-moving, but I find it to be helpful in understanding all of the aspects of the recipes. Of course, Bubbe is full of her own little surprises and is a very entertaining host. This a cooking show that actually takes you into the home of Bubbe so you feel as though you are cooking right beside her or better yet—one of her grandchildren waiting at the table. Try out one of Bubbe’s recipes, I promise you won’t be disappointed. Posted by chalutzproductions on December 31, 2012 in Podcasts / Online Shows, Press. For Avrom Honig, founder of Chalutz Productions, necessity was the grandmother of invention. Filming his now 85-year-old Bubbe cooking in 2006 became his media entrée and the start of a culinary collaboration. “I never expected to become so close to my grandmother and that I would always be able to share with future generations her legacy in the kitchen,” he admits. That serendipitous sharing is now two-fold: a Jewish Life TV vodcast called Feed Me Bubbe (www.feedmebubbe.com) and a new cookbook of the same name (Feed Me Bubbe: Recipes and Wisdom from America’s Favorite Online Grandmother ) from Running Press, winner of a gold Mom’s Choice Award. Posted by chalutzproductions on May 1, 2012 in Newspapers / Magazines, Press and tagged Best of the Press. In July 2010 we introduced you to an 83-year-old Massachusetts grandmother who, with the help of her grandson, started theFeedMeBubbe.com website that features her demonstrating the art of cooking traditional Jewish recipes. Now, two years later and just in time for Pesach, Bubbe (she will not disclose her real name) shares a video of her preparing and baking recipe number 36, Apple Matzah Kugel. The recipe also appears on page 171 of her book, Feed Me Bubbe, which is available in paperback and Kindle editions. This Wednesday is Baking for Pesach day at Jewish Humor Central, and we’ll be adding Bubbe’s recipe to our own baking list. Enjoy! Posted by chalutzproductions on April 2, 2012 in Uncategorized. While the obvious choice might be hamantashen, there are other options. There is something special about yeast-leavened pastries, or, in Hebrew, ugot shmarim. Halfway between pastry and bread, their aroma, taste and tender texture make them hard to resist, whether for breakfast with coffee or for afternoon tea. Indeed, when I visit a pastry shop, yeast cakes usually tempt me more than heavily frosted layer cakes or gooey, sticky cupcakes. Posted by chalutzproductions on March 1, 2012 in Newspapers / Magazines, Press. It’s not a technological breakthrough or cutting-edge website, but rather a genteel personification of all things grandmotherly. Meet Bubbe, who is the most surprised of all. She said that when it all began six years ago, she knew absolutely nothing about the Internet or YouTube, but couldn’t say no to her beloved grandson’s request to make a video of her doing what she does best-cooking and rhapsodizing in the kitchen. Bubbe, who prefers her nom de plume to her name from her non-digitized life, has ever since stirred, intoned, confided, and warmed her way into the hearts of untold stressed-out, complex lives around the world. In a time of ultra-fast, pre-prepared, grab-and-go cuisine, a throwback Jewish grandmother has risen to the top-pun intended. In January, Bubbe’s 2011 book, “Feed Me Bubbe: Recipes and Wisdom from America’s Favorite Online Grandmother” ($16, Running Press, 224 pages)-walked away with Joy of Kosher’s “Best New Kosher Cookbook of 2011” award. With the help of her grandson, Avrom Honig of Brookline, Mass. Bubbe has cornered the industry with an online TV show, blogs, podcasts and media appearances. She has a website (www.feedmebubbe.com), a Wikipedia entry and a Facebook page, and Avrom’s got her covered on Twitter, YouTube, WordPress and Blogspot. Bubbe thought one or two videos would be it, but the emails poured in. “It was 20, 30 close to 50, then hundreds,” she recalled. Posted by chalutzproductions on February 8, 2012 in Newspapers / Magazines, Press. Massachusetts-based Internet cooking sensation wins Best New Kosher Cookbook of 2011 award. Mix together segments of social media and three tablespoons of sour cream. Cover with plastic wrap and set overnight. Garnish with applesauce, and serve. All together, you’ve got a thoroughly heimish, warm and comforting Internet sensation.It’s not a technological breakthrough or cutting-edge website, but rather a genteel personification of all things grandmotherly. Meet Bubbe, who is the most surprised of all. She told Joint Media News Service that when it all began six years ago, she knew absolutely nothing about the internet or YouTube, but couldn’t say no to her beloved grandson’s request to make a video of her doing what she does best—cooking and rhapsodizing in the kitchen. With the help of her grandson, Avrom Honig of Brookline, Mass., Bubbe has cornered the industry with an online TV show, blogs, podcasts, and media appearances that have included a spot on ABC World News and inclusion in the PBS“Frontline” TV/Web documentary “Digital Nation: Life on The Virtual Frontier.” Her benevolent visage graces online t-shirts, mugs, can coolers, aluminum water bottles and travel mugs. She has a website (www.feedmebubbe.com), a Wikipedia entry and a Facebook page, and Avrom’s got her covered on Twitter, YouTube, WordPress and Blogspot. But Bubbe offers something different. “It’s an era of cooking that was more about heart and soul, and Bubbe with her grandson Avrom, I believe, are touching people’s hearts and souls and tummies,” Geller said. The road to success hasn’t been paved with gold or a legion of assistants for this matriarch. “Feed Me Bubbe,” the Jewish cooking show that launched in June 2006 on Internet TV software provider Instant Media, is, according to Honig, still produced by podcast on a shoestring budget, under the auspices of his own Chalutz (Hebrew for “pioneer”) Productions. Bubbe begins each episode with a recipe and a lesson on how to cook it. In between the rising steam and moving spatula, she relates anecdotes from her past and offers a “Yiddish Word of the Day” to Honig. Bubbe began addressing viewers’ questions in another portion called “Ask Bubbe.” A hit from inception, the show was nominated for the network’s first annual Vloggie Awards, in the cooking category. Bubbe had retired at 73 from a career in banking and was busy with her organizations and activities, but she agreed to let Honig tape her making her signature “Jelly Jammies,” a recipe she had invented while working full time. “I handled municipal accounts, and I also had to put the children through college, as we were on limited means,” she recalled. “Strudel took a long time to leave out, and I didn’t have the time.” So, Bubbe developed a batter that would work quickly, and the treats proved wildly popular. Bubbe thought one or two videos would be it, but the emails poured in. Posted by chalutzproductions on February 5, 2012 in Newspapers / Magazines, Press. Posted by chalutzproductions on January 30, 2012 in Newspapers / Magazines, Press and tagged Best of the Press. 84-year-old YouTube sensation makes stop at Congregation B’nai Israel. “It’s really telling that the general public is appreciating Bubbe, no matter what their background is,” said Avrom Honig, the grandson of the 84-year-old Jewish woman, known simply as “Bubbe,” who has brought Kosher cooking to the masses. At a presentation at Congregation B’nai Israel Wednesday night, the pair ruminated on the success of Feed Me Bubbe, their online cooking show and Kosher cookbook. What started out in 2006 as a experimental project with Honig taping his grandmother making her favorite dishes, brought the pair international popularity after the YouTube videos went viral. Their new book, Feed Me Bubbe: Recipes and Wisdom from America’s Favorite Online Grandmother has won the Gold Mom’s Choice Award for Biographies and Memoirs and was recently awarded Best Kosher Cookbook of 2011. Amazon rated Feed Me Bubbe #1 Bestseller in the Kosher category. Stories on Bubbe have appeared in The Boston Globe, ABC World News, the Wall Street Journal, The New York Post, and in a PBS FRONTLINE documentary, entitled Digital Nation. Honig, who has a communications degree from Worcester State College, realized the marketing potential of the online shows early on and is credited with using his internet savvy to take the project to the next level. Feed Me Bubbe has 2,603 Facebook followers and, thanks to Honig’s coaching, Bubbe herself has written 363 tweets. At feedmebubbe.com, fans can find recipes, watch videos and even learn Yiddish. The pair said that they originally had no interest in creating a cookbook, but responded to the demand of their audience. When deciding how to structure the publication, they turned to their Facebook followers. “Ok time to play the who should be on the back of the book game. Any celebrities that you feel we should try to reach out and see if they will leave a comment on the back of the book? Post them as you think of them!” Bubbe wrote on the social networking site on Dec. 14, 2011. Jewish Alliance of Greater Rhode Island set up Wednesday night’s event, which included a sampling on some of Bubbe’s most popular dishes, prepared by members of the congregation. The ever-humble Bubbe does not give out her name and would only tell the audience she’s from “a town in New England.” She prefers simply to be thought of as “everyone’s Bubbe” and to bring her culinary knowledge to those who can benefit from it. Check out Feed Me Bubbe on YouTube, attached above or catch the program on Jewish Life Television at http://www.jltv.tv/home.php. Posted by chalutzproductions on January 19, 2012 in Podcasts / Online Shows, Press. Posted by chalutzproductions on January 9, 2012 in Pareve, Recipe, Video and tagged aluminum pie pan, basil pasta, bitter sweet chocolate, breakfast, chopped walnuts, cold water faucet, cup bread crumbs, dessert, dinner, egg mixture, food, honey mustard, matzo meal, mushroom mixture, mustard mixture, oil mixture, sized onion, slice mushrooms, tbs oil, vegetarian, vegtable oil, water pinch. WOONSOCKET – The PJ Library and Congregation B’nai Israel will welcome Bubbe and her grandson Avrom Honig to the synagogue (224 Prospect St., Woonsocket) on Wednesday, Jan. 18, at 7 p.m. In addition to recipe tastings and readings from “Feed Me Bubbe: Recipes and Wisdom from America’s Favorite Online Grandmother” (Running Press, 2011), they will share their stories in this free program. A dessert reception and book signing will follow; B’nai Israel is at 224 Prospect St., Woonsocket. Just who are Bubbe and Avrom? In 2006, Bubbe (Yiddish for “grandmother”) was trying to help her grandson Avrom Honig produce a video, as he was trying to obtain employment with a video production company. Calling herself Bubbe – a representation of anyone’s Jewish grandmother – Avrom’s grandmother is from New England although she’s yet to reveal her full name and city of residence! Avrom’s first video of Bubbe, “Feed Me Bubbe,” depicted her family’s recipe for Jelly Jammies (recipe follows). It went viral on YouTube, and Bubbe became a nearly overnight sensation. On her PBS show, Bubbeshares recipes, stories, life lessons, advice and a Yiddish word of the day. Bubbe and Avrom have been featured in several national media outlets. A retired bank employee, Bubbe launched her new career at age 80. She tweets, responds to fans’ emails from as far away as Australia and Africa, and answers questions at book events all across New England. Preheat oven to 400. Spray a 9 x 9-inch baking pan with nonstick spray, or line bottom and sides of pan with nonstick aluminum foil. In a medium bowl, stir strawberry jam, apple, lemon juice, lemon zest, walnuts, cinnamon and raisins until combined. Set bowl aside. In another medium bowl, sift together flour, salt and baking powder. In a large bowl, beat margarine and sugar with an electric mixer until light and fluffy, about 2 minutes. Beat in egg and vanilla extract. Slowly add flour mixture and beat, scraping the sides as you go, until it is well mixed and forms dough. Bake for about 25 minutes, until filling is bubbling and dough is golden brown. Cut into 16 squares while still warm. They are hard to cut when completely cool. This pareve recipe makes 16 servings. For more information, contact Michelle Cicchitelli at 421-4111, ext. 178, mcicchitelli@shalomri.orgor Congregation B’nai Israel at 762-3651. Posted by chalutzproductions on January 6, 2012 in Newspapers / Magazines, Press. This is your grandmother’s cooking, homestyle Jewish food that has been served for generations. Bubbe, the grandmother of Avrom Honig, began a new career at eighty, when her grandson Avrom asked her to let him make a video of her cooking for a demo to help him find a media job. From a YouTube video, an online cooking show was born. Practical and wholesome, Feed Me Bubbe is Jewish Cooking 101 with a supportive and experienced teacher who laces her lessons with personal anecdotes, advice, and a Yiddish word a day. Chopped herring, brisket, chicken fricassee, stuffed cabbage, matzo brei, a variety of blintzes, kasha varnishkes, potato knishes—for everyone who craves the food of his or her grandmother, Feed Me Bubbe serves it up clearly and concisely. The chapter on baking is particularly attractive, with easy-to-bake home cakes and cookies, highlighted by Bubbe’s signature Jelly Jammies. But Bubbe is open to innovation, substituting tofu and low-fat ingredients to reduce cholesterol in classic dishes, enclosing kreplach in wonton wrappers, and embracing new flavors like honey mustard for baking salmon and lavash for Lox and Cream Cheese Rollups. Like most skilled everyday cooks Bubbe uses ready-made ingredients judiciously—bouillon cubes if necessary to bolster chicken soup, packaged puff pastry, ketchup—to save time without sacrificing flavor. All the recipes are kosher, with symbols indicating whether they’re meat, dairy, pareve, or for Passover. To round out her book, Bubbe has a short list of her favorite Yiddish songs, which she suggests listening to while cooking; menus for the holidays and for everyday; a glossary of basic cooking words; and formulas for metric conversion. Although Bubbe doesn’t divulge her name or address, she does give a phone number and e-mail address to which readers can address questions. Proudly old-fashioned, Feed Me Bubbe is a lively and relevant guide for the homestyle cook. Index, photographs. Posted by chalutzproductions on January 4, 2012 in Podcasts / Online Shows, Press and tagged Best of the Press. “Feed Me Bubbe”: Reading So Good You Can Almost Taste It! This is a guest post by Sarah Routman, Executive Director of Hillel at the UofM. Sarah once harbored dreams of combining photography and writing and travelling the world to record her experiences. Only in the Twin Cities for the past 16 years, she is happy to write guest posts for TC Jewfolk when the opportunity arises. Sarah loves to read, after this book, cooking is more appealing than ever! From the first turn of the page, I was hooked on Feed Me Bubbe: Recipes and Wisdom from America’s Favorite Online Grandmother (Running Press, 9/6/2011), thinking of so many people I should gift the book to immediately. I am a wife and mother of two twenty-something girls. I remember the day it was my turn to spend the day in the kitchen with my own mother, learning how to make spaghetti sauce from scratch. Another day I learned the secrets of flipping the blintzes like a pro, and while other teens were busy babysitting, my sisters and I sat at the table calculating the price of 1 egg and a cup of flour as we prepared to launch our own bakery business from home. So, I am comfortable in the kitchen. Not so my older daughter. No amount of coaxing could get her to learn much. She just doesn’t like to cook. She lives on sandwiches and cereal. She loves good food, but prefers to check out the local eateries in Philadelphia where she lives rather than invest in a good cooking knife. I even tried packing up some of my most treasured kitchen necessaries for her when she got her first apartment. She kindly told me the items would go to waste in her apartment. But, she always wanted to learn Yiddish, and so I’ve decided this is the PERFECT book for her! She will love the anecdotes and the Yiddish word of the day sprinkled throughout the book. My younger daughter may appreciate the information about keeping kosher. Though ours has not been a kosher home, my sister is Orthodox and we are all aware of some of the rules. I think having more of the specifics spelled out will have a certain appeal to her, especially since no one is telling her she has to do it. And since she likes cooking, and is already pretty good at it, I wouldn’t be surprised if she decides to take a more active role in some of the family holiday cooking in the future because of this book. One can always hope – an extra hand in the kitchen at holiday time is always a good thing! Anything to keep educating our children about Judaism is a good thing, I think. From knowledge will come something: appreciation, or connection to a long line of tradition, and for sure, a good meal. Who can go wrong with that?! No matter what, the sheer knowledge, and especially in such an accessible format, can only be positive. When I spoke to Bubbe (yes, the Bubbe that is the author of the book) and her grandson, Avrom, it became obvious that the magic of this particular cookbook is connected to this passing on of knowledge. It started for Bubbe as a response to her cooking show. The fans kept asking if they could adopt her. Mostly twenty to forty-somethings, they asked for a cookbook. Watching her on-line cooking show, they began to feel comfortable in their own kitchens. As Bubbe built up their self confidence, they wanted to try it on their own. Bubbe had long ago stopped measuring things – you know how the great cooks do it – a pinch of this, a dash of that – add till you get just the right consistency or texture. Impossible directions for those terrified of cracking an egg in a bowl. So Bubbe started over, and with the help of her grandson, Avrom, she started writing everything down, measurements and all. The goal was to create a recipe so that Avrom could make it. She actually tried to simplify it as much as possible. If he was comfortable looking at the recipe and felt he could do follow it, then Bubbe was confident that others, also skeptical of their own cooking talents and abilities, would be able to succeed. Many of Bubbe’s fans and followers are in college. Reading a recipe, they often find they are missing all sorts of ingredients. Or are confused about terms that those of us who are frequenters of the kitchen (from the cooking side) take for granted – like the word ‘bake’ for instance. Bubbe assumes nothing from her viewers or readers and explains everything to encourage even the least courageous, to find success in the kitchen. As my own mother used to say, “If you can read, you can cook.” With Feed Me Bubbe, this is certainly the case! The Feed Me Bubbe cooking show has been online since 2006. The book came out in September of this year and is already in its 2nd printing. The Mom’s Choice Awards® has named Feed Me Bubbe: Recipes and Wisdom from America’s Favorite Online Grandmother by Avrom Honig and Bubbe among the best in family-friendly media, products and services by awarding their book a GOLD award. “Our judges loved your ingenious blend of recipes and wisdom…I look forward to following your continued success,” Dawn Matheson, the Executive Director of the Mom’s Choice Awards, posted on the Feed Me Bubbe Facebook page. 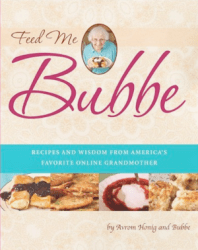 Amazon also rated Feed Me Bubbe #1 Bestseller in the Kosher category. Bubbe and Avrom appear at events and people often buy anywhere from 2-3 copies to 10 copies of the book at a time. Fans have commented that the book is “saving our family” and it is often deemed the perfect gift for newly married couples. It makes Bubbe happy and proud to be able to encourage young people to try their hand in the kitchen, to pass on traditional Jewish cooking in easy steps so as to keep the old recipes in Jewish households today. Bubbe is quick to point out that you don’t have to be Jewish to enjoy her show or her book. There’s something in here for everyone, and anyway, who doesn’t love matzah ball soup, or a potatoe knish? As for Avrom, he always liked playing around in the kitchen, but he didn’t know he had it in him to be a gourmet. He was surprised at how easy it was to master some recipes that until he tried them, he was sure were more than elusive. In retrospect, he is shocked that he was stuck in sandwich mode for so long. Maybe there is hope for my older daughter yet! Avrom’s first venture into more advanced cooking was Bubbe’s 4-bean salad. He made it to rave reviews and though he was initially stressed about doing it, in the process he discovered that in reality it was FUN to make it! The encouragement he got from those who tasted it, built his confidence to try other things. His favorite recipe that he has mastered is Bubbe’s sweet and sour meatballs. His tip: it’s all in the sauce! Don’t stress about the size of the meatballs, a step he admits caused him some trepidation at first. What he discovered is that the size and shape of the meatballs do not impact the taste. Concentrate on getting the sauce right, and the creation of the meatballs themselves will manage to merge with the delicious taste. Aesthetics aside, the sauce is where the energy should be placed. Bubbe’s favorite recipe is jellie jams. She was working full time and didn’t have time for elaborate cooking, so she devised a recipe for the dough that was very easy. Most of her recipes are no-fail recipes, she says, with items that you use all of the time. Her goal is to help people make a delicious hit every time! I’m not sure what I enjoyed more: reading Feed Me Bubbe, looking at back episodes onfeedmebubbe.com, or speaking to Bubbe and Avrom about their successes and future goals. Her recipe for chopped chicken liver sounds so easy, I’ve committed to trying it myself. I confess that I always believed it to be such a major kitchen endeavor I never even asked my mother for her recipe. I recall it being such a delicacy and my memory is that it was labor intensive. A family favorite for years, it just never occured to me that I would be able to make it so I never even asked my mother how to do it. With Bubbe’s recipe, I intend to suprise my parents next time they come to town to celebrate one of the holidays with us. If you read this book and like it, click here and vote for Feed Me Bubbe on the Joy of Kosher’s website for Best New Kosher cookbook. It may be too late to give this book as a Chanukah gift, but it’s a perfect gift anytime! Already in the lead on Jamie Geller’s joyofkosher.com favorite kosher cookbook contest, help Bubbe and Avrom secure best kosher cookbook award. Nominations and voting ends January 11, 2012. Winners will be announced on February 1st online and in the Joy of Kosher with Jamie Geller Magazine. Winners will receive a Best of Kosher web badge to display on their site. Posted by chalutzproductions on December 29, 2011 in Podcasts / Online Shows, Press and tagged Best of the Press. Lately, I’ve had the good fortune of sharing my favorite recipes with the help of my grandson, Avrom Honig. Together, we’ve made a series ofvideos and now, a cookbook , called Feed Me Bubbe, which chronicle the Jewish comfort foods—borscht, brisket, kasha varnishkes—that I’ve been making my family for years. I don’t mean to be immodest, but my latkes might be their all-time favorite from my repertoire. My grandchildren eat them up faster then I can make them—they can take down a dozen in a sitting. I don’t blame them. Hot, crispy, and tender, they’re very easy to eat. I fry a batch at least once during the eight-day holiday (sometimes, I’ll make extra and freeze them). The sight is a familiar one to people who know me—my kitchen table covered with paper towels, ready to blot the latkes of their excess oil. My home ends up smelling like fried potatoes for well over a week, but it’s worth it. There are many recipes for potato latkes, but mine are simple to make and delicious. Don’t worry too much about the measurements. No matter how you do it, it’s going to taste good. Posted by chalutzproductions on December 23, 2011 in Newspapers / Magazines, Press and tagged Best of the Press.